Another post in my continuing “Days of Yore” series, catching up on long-overdue photos of Truman’s final days as a puppy-in-training…. My dogs are Bruins, whether they like it or not. 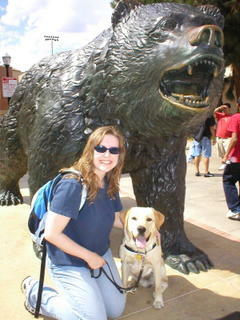 We always take photos on campus at UCLA, my alma mater (Wolf’s too!). Lomax did it, Truman did it, Jethro will do it as well. A photographer friend of mine (check out her portfolio!) took some shots of Truman for me, because I needed some good hi-res ones to submit for our puppy group’s annual calendar. She took some of us as well…and since Wolf and I already knew at this point that we were going to get married (though it wasn’t yet public knowledge), and since Truman has been part of our relationship since the beginning, and since we didn’t take any “official” ones, I kinda consider these our engagement photos. Maybe later I’ll Photoshop my ring into them, heh heh. Lomax is now a Bruin. I took him to UCLA today, to walk him around campus and experience a little college life (and no, I did not take him to a frat party). Unlike Janna, who is afraid of bronze lions, Lomax had no qualms at all about being asked to pose for a photo with the big statue in the middle of Bruin Walk. We surveyed campus from the top of Drake Stadium, traversed Royce quad and ducked inside Powell Library, stuck our noses into the Kerckhoff Coffee House for a quick java sniff, and descended Janss Steps (though I couldn’t expect him to skip the sixth step…hope that doesn’t mean he’ll end up an extra year in guide dog training). Lomax was well behaved in the student store, and if it hadn’t been $25, I would have bought him a blue-and-gold UCLA Bruins dog collar. He even sat calmly while we listened to the UCLA Bruin Marching Band drumline warm up outside Pauley Pavilion. I, on the other hand, could hardly prevent myself from marking time during the cadence….